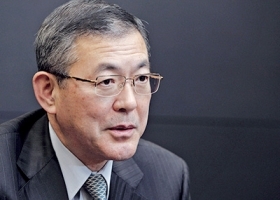 Subaru boss Yasuyuki Yoshinaga: "We are at at important turning point." TOKYO -- Subaru sales are booming. But Yasuyuki Yoshinaga, president of Subaru-maker Fuji Heavy Industries, says there is such a thing as too big. He wants to cap annual sales at slightly more than 1 million vehicles to preserve the brand's niche appeal. Managing Subaru's breakneck growth may prove challenging as the company brings new capacity online and introduces a seven-seat crossover in the next few years. Yoshinaga said that Subaru has settled on a maximum annual production capacity of 1.03 million vehicles. That can be pushed 6.8 percent higher to 1.1 million with overtime. No new factories are in the works. "We are at an important turning point," Yoshinaga told Automotive News at the Tokyo Motor Show. "Many companies try to be bigger or sell more vehicles. If Subaru does the same thing, we will lose our characteristics." In the U.S., Subaru expects a seventh consecutive year of record sales this year. With sales approaching 600,000 vehicles, tight product supply is the only thing putting the brakes on growth. Subaru sold 513,693 vehicles in the U.S. in 2014. After a 21 percent gain in 2014, Subaru's U.S. sales through September have risen 14 percent to 428,702. Next year, Subaru will add production of the redesigned Impreza compact to its factory in Lafayette, Ind., where annual production capacity will grow to 400,000 by the end of 2016 from 290,000 today. Subaru produces the Legacy sedan and Outback crossover in the U.S.
Yoshinaga confirmed that Subaru expects to produce its new seven-seat crossover in Indiana. The vehicle won't be named Tribeca, the moniker of Subaru's crossover that ended production in January 2014. The new vehicle is designed for the U.S. "It will only be sold in North America," Yoshinaga said. He didn't give a volume projection. When the Tribeca debuted in 2005, Subaru of America expected annual sales of about 36,000 vehicles. But with its quirky looks and cramped rear seating, the crossover posted sales of 18,614 in 2006, its first full year, and only 1,598 in 2013. Subaru will position its first plug-in hybrid -- due in the 2018 model year -- mainly as a zero-emissions compliance play. Subaru doesn't plan to sell it in Japan, even though hybrid vehicles account for 18 percent of Japan's light-vehicle market. Subaru will offer the plug-in hybrid only in markets where required by regulations, Yoshinaga said. He declined to disclose which of Subaru's current models will get the hybrid drivetrain. But he confirmed that Subaru will build a new-generation BRZ coupe with partner Toyota Motor Corp. "We have already agreed with Toyota we will do a full model change. We have not decided when it will be introduced," he said. The rear-wheel-drive BRZ is the only car sold by Subaru in the U.S. without all-wheel drive; Yoshinaga declined to give details on the configuration of the redesign. The BRZ was launched in 2012. Toyota sells its version of the jointly developed coupe as the Scion FR-S.